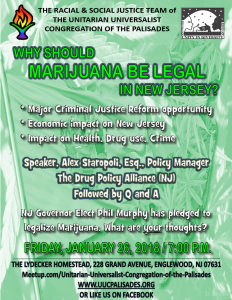 On January 26, 2018 at 7:00 p.m. the Racial and Social Justice Team, a committee of the Unitarian Universalist Congregation of the Palisades (UUCP), will hold a public meeting on the important question of the legalization of Marijuana in New Jersey. 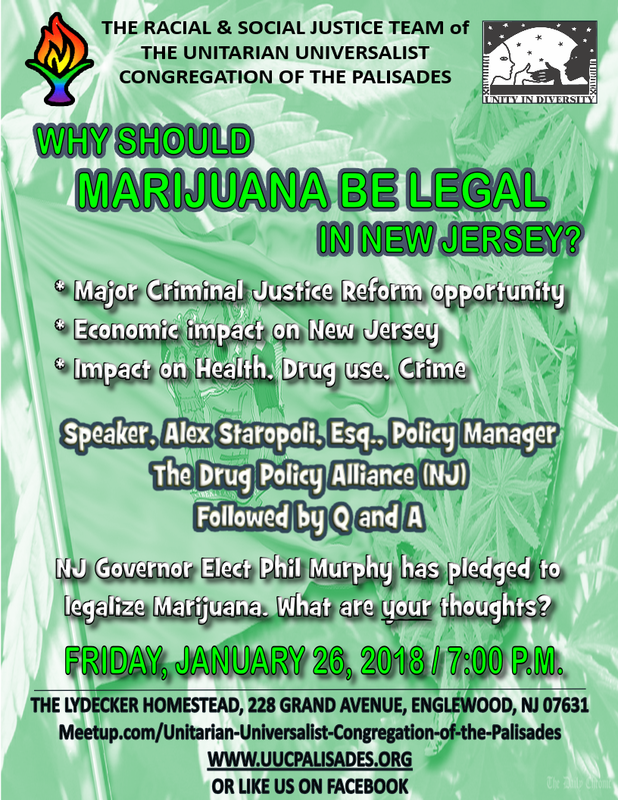 Alex Staropoli, Esq., the Policy Manager for the Drug Policy Alliance (DPA), New Jersey office, will be the speaker. Legalization of marijuana is on the agenda of incoming Governor Phil Murphy’s administration. Eight states and Washington D.C. have already legalized use of recreational marijuana with constructive results. Although there is controversy around this issue, there are many benefits to legalization including but not limited to creating jobs, boosting the economy, providing funds for important social programs and abolishing the racial and social injustice of existing marijuana laws. Speaker, Alex Staropoli, has worked on a variety of drug policy issues with a focus on criminal justice reform. Prior to joining DPA, she was the Senior Policy and Legislative Analyst for the Governor’s Office of Crime Control & Prevention in Maryland where she worked on a wide range of criminal justice issues including pretrial justice, substance abuse treatment and overdose prevention, domestic violence and reentry. We invite all to attend the event on January 26th for information, questions and discussion.